The Domesday Book of 1080 mentions an Anglo-Saxon church in Pulham but there is no trace of it today. The present church is dedicated to St Mary the Virgin and is thought to date back to 1253. It is mainly perpendicular in style, has a square tower with 8 bells, and was restored by Bodley in the late 19th century, although many of the original features still remain. The church registers date back to 1538. The impressive porch, built about 1478, was described by Nikolaus Pevsner as ‘something phenomenal’. 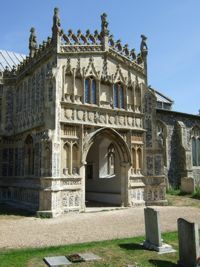 It is decorated with large figures of angels and other images and the pierced parapet is comparable to work at both Blythburgh and Attleborough churches. There are many interesting features inside the church, including a 15th/ 16th century stone font whose decoration was plastered over to prevent mutilation from Cromwell’s men and was only discovered during restoration in the late 19th century. John Betjeman thought it ‘amazing’. The screen, partly medieval and partly restored, has large painted panels filled with 15th century images of the Apostles. The chancel is the oldest part of the church and contains some very important early English features including a double piscina in the south wall. 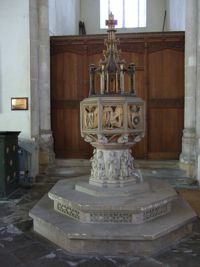 It is thought to date from the 13th century and is very rare in Norfolk churches. 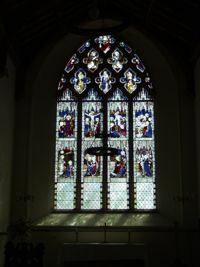 Other notable features include the 15th century benches, a 16th century lectern and some glass dating back to the 14th century, indicating the fine windows that existed from a very early date. There is also evidence of the presence of the old Guild Chapel which once stood on the site of the present vestry. It was rebuilt in the centre of the village in 1401 and is now part of the Pennoyer Centre.